Today I would like to talk about another beauty from Aroma Essentials. Its their Vitamin C Day Serum. Nowadays, Vitamin C serums have become quite popular. However, most of them are from Korean brands and priced high. I wanted to try a Vitamin C serum but was looking for some Indian brands. And then Aroma Essentials sent me their newly launched Vitamin C Day Serum and Night Serum 😀. If you have followed my blog, you would know Aroma Essentials is a brand that I absolutely love and trust. If you need results → go for Aroma Essentials, period. So let’s see what Aroma Essentials Vitamin C Day Serum does for the skin. Meanwhile, you can check out my reviews of other Aroma Essentials products here. Your skin’s daily companion! That’s how you would call our 100% pure and natural handmade skin potion – Aroma Essentials Vitamin C Enriched Day Serum, as. And why so? Because each and every ingredient teamed to concoct this skin-friendly elixir has skin benefits in galore. Right from the presence of 24k gold leaves that are said to fade sun spots, age spots, unevenly complexioned skin, dullness, etc, to rice extract that has been regarded highly in South Asian beauty recipes for its ability to lighten a haggard skin tone, a few drops of Aroma Essentials Vitamin C Day Serum, when massaged on one’s skin would leave it smooth, glowing and oil-free. Yes, oil-free! Wave a goodbye to greasy serums that leave your skin clammy, dull and oily. Ours blend it with your like a hot knife running through butter.. effortlessly. Team it up with Aroma Essentials Sun Block and voila, your skin is protected by harsh UV rays of the sun. Complete skin care in a nutshell? Yes, you got that correct. Vitamin C 12%, Wheat Protein, Rice Extract, Hyaluronic Acid. Aroma Essentials Vitamin C Day Serum comes in dark tinted glass bottle with a false dropper. I wish they had provided an actual dropper as the serum couldn’t come out with this false dropper and I had to pour it out everytime. 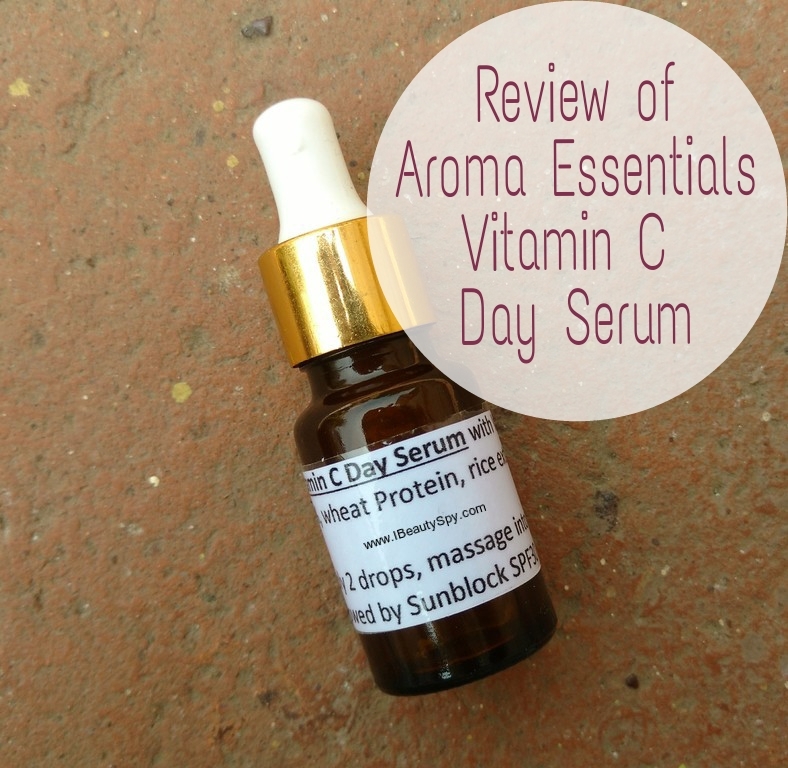 Aroma Essentials Vitamin C Day Serum has a slight citrusy scent which feels refreshing. The consistency of the serum is just like water. There is no oil in it. It is colorless and transparent as you can see in the images. If you are new to using Vitamin C in your routine, you may experience slight skin irritation for first few days. Once your skin adapts to the percentage of vitamin C, then you can start seeing the effects of the serum. Though the serum is just like water, it hydrates the skin as it contains hyaluronic acid which is an excellent ingredient for hydration. This is the common ingredient in most of the sheet masks. However, if you have dry skin, you would need to follow up with a moisturizer. And of course, sunscreen is a must. Most people think that Vitamin C serums should not be used in the morning and only in the night. But on the contrary, vitamin C actually helps in boosting the efficacy of your sunscreen. I too was surprised when I came across this fact. Actually there are different forms of vitamin C serums, some of which are photoprotective and some of which are photooxidative. But this one is specifically a day serum so you can safely use it during daytime. But it is mandatory to follow with a sunscreen with high SPF. 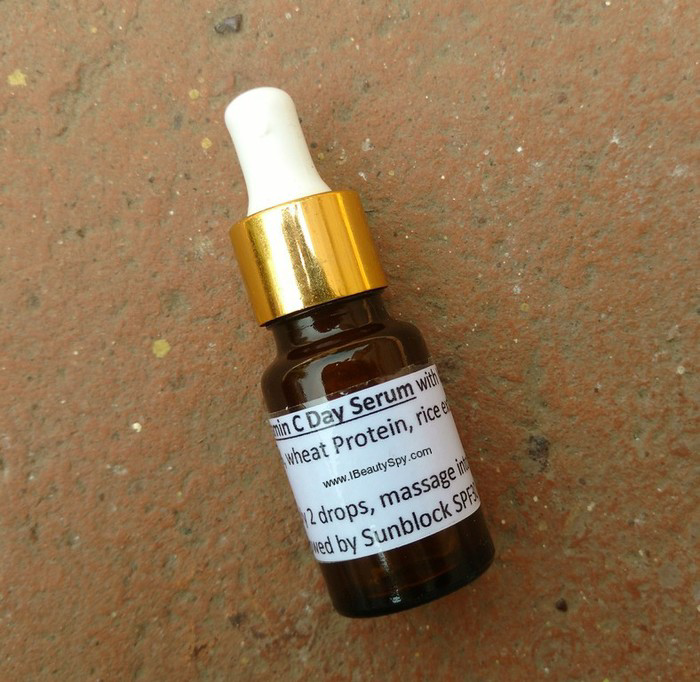 I was using this serum along with the Aroma Essentials Vitamin C Night Serum as well. And after two weeks of using, I could see a visible brightness and lightening in my skin. It clarified my skin and my skin was looking clearer than ever. I had some pigmentation, uneven skin tone and dark skin around my lips. All that was reduced drastically. My dark spots and acne scars have also started fading. My skin texture has improved and also skin feels firmer. I like the fact that apart from vitamin C, this serum also contains hyaluronic acid, wheat protein and rice extract. Hyaluronic acid hydrates and retains water content in the skin. 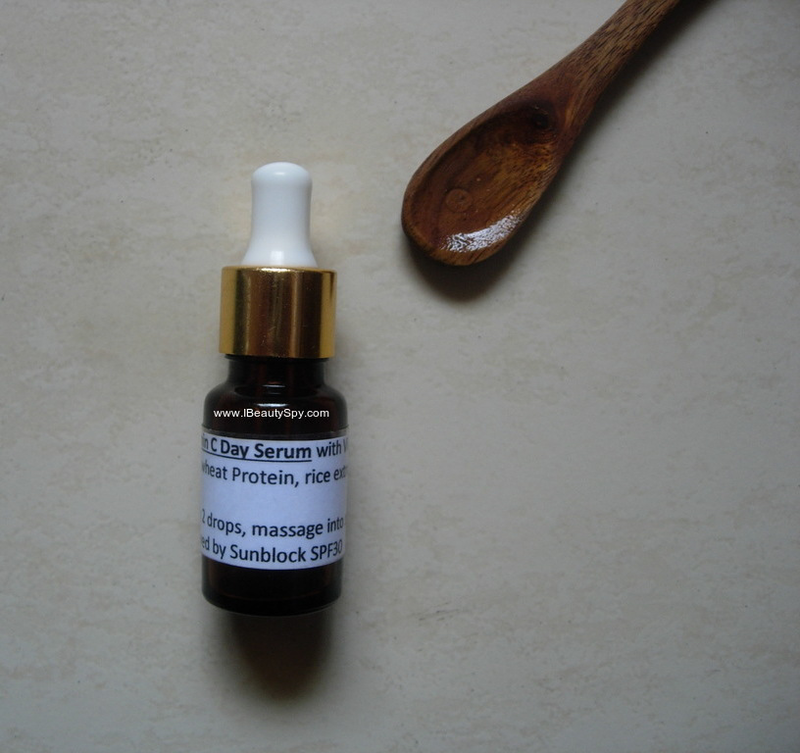 While rice extract helps in brightening and clarifying skin. Wheat protein helps to improve the appearance of skin, minimize pores and is rich in ceramides which nourish, strengthen and plump skin. * Clarifies and clears skin. * Reduces pigmentation and uneven skin tone. * Works on dark spots and acne scars. * Brightens and lightens skin. * Light, watery consistency. 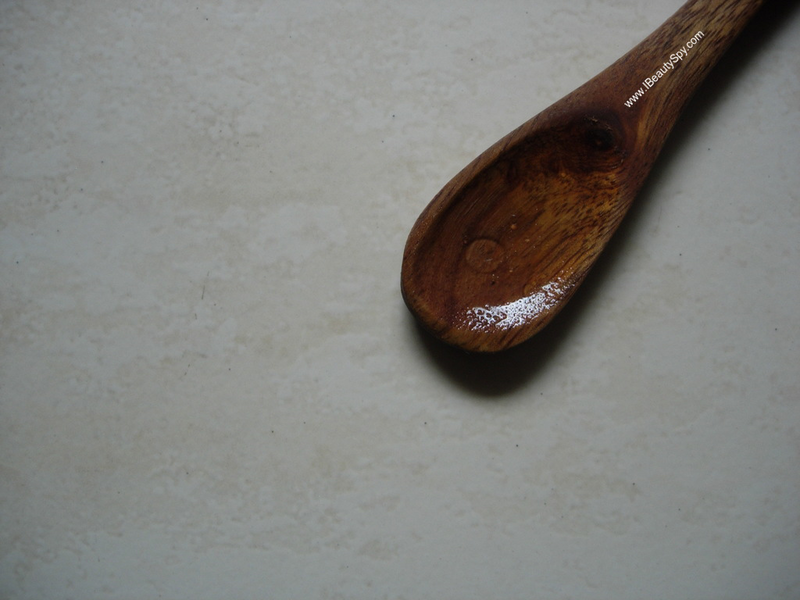 No oiliness, stickiness. False dropper packaging can be changed to actual pressable dropper. Maybe. But I would like to try their other variants, especially their tomato serum. Yes. Price is similar to other serums in the market. Am happy that our very own Indian brand has come up with a vitamin C serum and that I don’t have to shell out more bucks for an international or korean brand. I like the combination of ingredients they have come up with for this vitamin C serum. My first vitamin C serum hasn’t disappointed me a bit and I have seen great results with it. It works as a great multi-tasker for different skin concerns (pigmentation, acne scars, brightening, lightening, dark spots, firmness etc) and types, so I would recommend you to try this one for sure. Don’t forget that vitamin C is rich in antioxidants and helps in collagen synthesis as well, so its a great anti-aging treatment to give you younger and youthful looking skin. P.S Products sent by the brand for consideration. But my opinions and reviews are unbiased and honest as always.